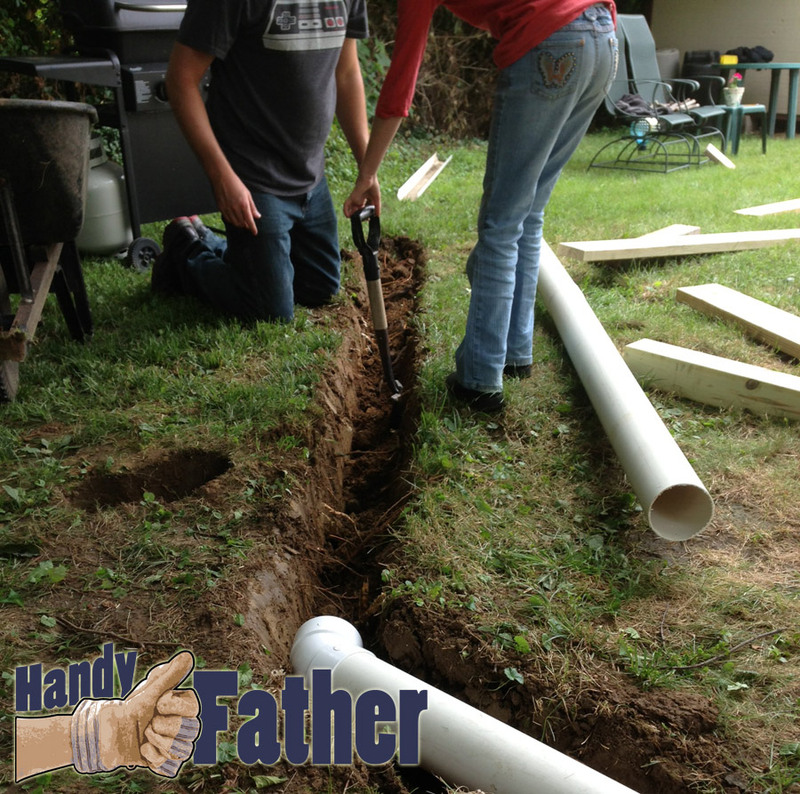 ← Handy Father Physical Fitness Day 2: Dig a trench, get strong. I spent a good deal of time yesterday creating a 10″ trench for rainwater. Drain rainwater away from foundations to eliminate foundation problems like bowing walls and water seepage in the basement. Another thing draining water from foundations does is keep water from puddling where you may have to walk. The building I dug a trench beside is about 60′ long and has three downspouts that converge onto a 6″ pipe. The pipe lead off the south end of the building, but ended not far from the corner. The added trench added also, an extra 20+ feet of drainage away from the building. The main focus I was worried about when digging the trench to drain rainwater away from foundations is to be sure that it slopes away from the building. The pipe at the building is above ground level, so each piece of pipe attached to the original is slightly deeper on the away side than the side close to the building. The drain I installed buried the drain pipe so to maximize the yard size, and also will make mowing easier without obstacle. The pipe also has a 45 degree angle to pint the water towards the downhill area of the yard. When figuring the trench location, I simply fitted the pipe together and used my shovel to make the initial shovel cuts in the sod on both sides of the pipe. When the trench was marked, I moved the pipe to one side, and cleared the trench of dirt. The trench grade slopes down from the building to the end. Once clear of dirt, I put the pipe back in and used a level to be sure the pipe slopes away from the building at all points. Once I was happy with the grade, I simply covered over the pipe with dirt. Be sure to drain rainwater away from foundations!